Regardless of whether you call it “Account-Based Marketing” or “Account-Based Sales Development” or “Account-Based Everything” this much is true: sales and marketing need to be tightly aligned around what accounts to target, what to say to the buyers within those accounts and the best way to engage those buyers. This is a key reason why we’ve invested so heavily in building out our platform for not just marketing, but for sales as well. 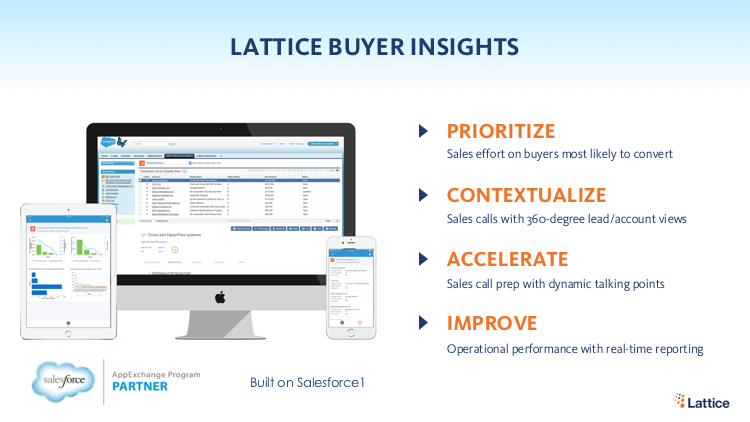 To that end, I’m excited to announce that the latest version of our sales-facing app, Lattice Buyer Insights, is now Salesforce AppExchange certified. Natively built on Salesforce1, the app is able to leverage Salesforce’s security infrastructure, is available on all devices supported by Salesforce1, is tightly integrated with the Salesforce CRM and is fully extensible via Force.com. Prioritize sales effort: Buyer Insights provides lead, contact and account scores that indicate which buyers are most likely to convert. Contextualize sales conversations: Buyer Insights integrates data from multiple sources (including your own transaction systems, MAP, ERP systems, etc.) so that reps get a 360-degree view of their prospects and customers. Speed up call prep: Buyer Insights makes sales reps more productive by providing a pre-built call plan. Everything that reps need to prepare for calls and make the best pitch is available instantly in their dashboard. Drive operational performance: Buyer Insights provides visibility into how predictive analytics is driving sales performance. 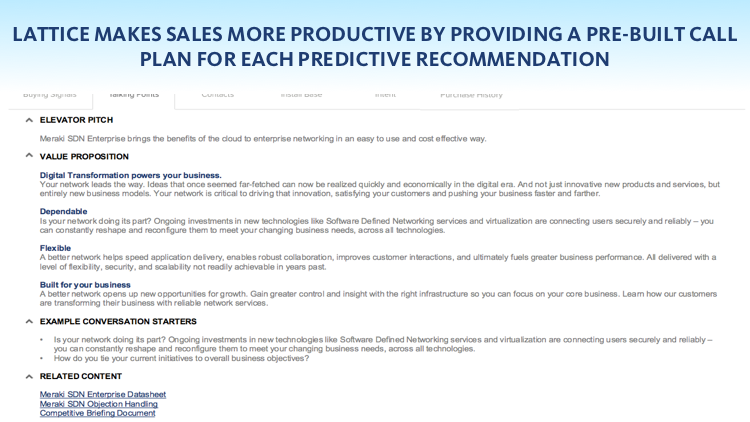 Executives can see how Lattice’s predictive recommendations are turning into pipeline and revenue, while front-line managers can monitor sales rep adoption and ensure that their teams are following up on highest quality accounts and leads. Most importantly, sales does not have yet another tool to log into. It’s tightly integrated into the Salesforce CRM UI and available to reps wherever they may be – whether at the office or on the road. To learn more, you can access the AppExchange Listing here.